If you head to any of Japan's big variety stores looking for stationery, you're sure to find a wide variety of cool items, from high-quality pens to notebooks! Here are 10 must-have Japanese items that make ideal souvenirs and gifts. Japan is renowned for its high-quality, creative, and stylish stationery, providing great shopping and entertainment to anyone who steps inside a shopping mall. Interesting stationery can be found in many places in Japan and the selection can be dauntingly large. Pricing depends on the store and item you are looking at, but you can find often find inexpensive stationery that is well-made. Continue reading to find where to shop for the best stationery and our top ten picks for items available in shops all across Japan. Some of the most well-known stores for stationery, paper goods, and study supplies include Itoya in Ginza, Tokyu Hands and LoFt chains, and the discount superstore chain called Don Quijote. Major 100-yen stores like Daiso and non-chain stores in traditional shotengai shopping streets all across Japan. 1. Highlighters and Pens - Make Studying or Card Writing a Snap! The right writing utensil can make all the difference, and finding the right one for you may take you a while when shopping in a Japanese stationery store. Even at small shops with stationery 20 different types of pens, and in major stores, you can expect to find anywhere from 50-200 varieties, both from within Japan and around the world. FriXion Ball Pens by Pilot have been a huge hit in Japan for a few years now, and they just keep adding more and more useful products to their line-up. A must have for anyone studying any subject, these erasable highlighters are ideal for when you go over a line, or find that you've highlighted too much. Their newest series of highlighters come in these gentle pastel colors, which are easier on the eyes than neon, but still can highlight very effectively. Lettering is such a popular hobby now, around the world and in Japan, and finding pens that can help you write both colorfully and elegantly can take a bit of work. Kuretake, an over 100-year Japanese stationery company that first produced sumi ink and brushes for calligraphy, also makes the Zig Wink of Luna Brushes. These filled brush pens combine a calligraphy brush-like tip with a fountain pen-like ink cartridge and come in several different shades of ink, including metallic shades of red and purple. Best of all, the inks are safe to use on photographs and are archival quality, so you don't have to worry about them fading or affecting the surface they're used on over time. If you've got a small gift for someone, but want to add a more personal touch to the card or letter that goes with it, then why not try adding your own stamp? A separate stamp and ink set is, of course, one option, or you can pick up a rolling stamp instead! The Irodori Decorne is a pre-inked rolling stamp that comes in five different variations, some featuring perfume bottles, cute alpacas saying 'for you', clovers, and more. All you do is place the stamp on the surface you want, press down lightly and roll it. That's it! Whether you are wrapping presents, making a scrapbook, decorating a phone case, or are just looking for something to make your picture frames and cards really memorable, washi tape (a type of patterned masking tape) has been popular in Japan for a number of years, and has made its way overseas as well in specialty craft stores. Recently, there have been two new types on the market, however, which have their own unique applications. Zitte Kirari is a patterned washi tape with a special peel away section in the middle, making it perfect for sealing envelopes or parcels that will soon be opened. The center panel of the tape has a message printed on it that can be easily pulled away, leaving a neatly patterned tape border behind, with no sticky residue to worry about. They come in six different patterns and colors, ranging from floral to seasonal designs. Or, if you are looking more for something to decorate with, but don't want a straight band of tape, why not pick up some of this decorative paper? Bande Masking Roll Stickers look like a roll of cut-out washi tape, but you can actually peel off individual designs and use them as stickers as well. These come in five different types at the moment, but according to the shop staff I spoke with, there are going to be some seasonal varieties available soon too. While many people may rely on their phones for taking notes, sometimes it does feel nice to have a proper notepad to keep by the phone where you can jot down important information, write someone a note, or even make your grocery list. In Japan, you can find notebooks in practically every shape, size and color, and recently, there have been a number of different note pads that look pretty realistic too! For example, this Pen and Deli notepad really looks like a strawberry donut, doesn't it? The paper is a bit thick too, which makes it sturdy and easy to write on as well. If you're on the go and need to write something down in a hurry, you may be tempted to do so on an old receipt or whatever else you happen to find in your bag, but what happens if you accidentally throw it away? With a mini memo pad, you don't have to worry about that happening. The Accordion Memo by +Lab is a small note book with a solid cover and elastic band to keep it closed, but the best part is that the pages are all connected accordion style, and can easily be torn off from one another along the perforated edge. Plus, the pages are printed with simple designs too, so if you need to make an impromptu card for someone, you're covered. Another item not to miss are the adorable, uniquely-shaped erasers found in Japan. From the realistic-looking sweets to sushi and maneki neko (beckoning cats), a large number of erasers you won't find anywhere else are in abundance in Japan. In particular, we recommend looking for IWAKO brand erasers, available in dozens of colors and varieties. They are also Japan-made, high in quality, and are found sold in sets at a variety of stationery stores across Japan for a few hundred yen. For a lower price, you can often find 100-yen stores carrying their own versions. A personalized notebook made with kimono fabric and other Japan-made materials makes an ideal gift or special stationery item you can use every day. While a number of stores offer customizable notebook making, Kakimori in Kuramae, Tokyo, is known for its stylish options. The notebooks here are also reusable and environmentally friendly: once you fill out all the pages, go back to the store and replace them. Are you looking for a way to sort out your schedule and every day in a fun way? Hobonichi Planner is a journal that allows you to log your daily plans, track goals, and write down any other thoughts you have. Many people also paste cuttings from newspapers and other study materials inside, as the pages are light but high-quality. The style of these planners is sleek and unique. They come in a variety of colors, sizes, and styles, and there are even covers you can purchase these planners to further customize these journals. Even if you are not used to journaling or writing down your schedule, this planner makes it easy and fun to become more organized. You can purchase Hobonichi products at stationery stores throughout Japan, including LoFt, and also at their official website. Clear file is shown on the right. Picture from Noren Kagurazaka - Cute Japanese Items You'll Want To Take Home! Clear files, or folders, are another unique item sold in abundance in Japan. These folders come in all different sizes, but the most common is an A4-size file (slightly taller than US letter paper size), making them convenient for organizing papers and loose notes. In addition to plain white or transparent files, you can find unique ones in all sorts of patterns, from anime characters to nature and reproductions of famous artwork. Souvenir shops at major sightseeing destinations may also carry a selection of clear files to make a fun, handy keepsake. Goshuin-cho, or seal books, are an excellent choice for those who collect the seals of temples and shrines in Japan. These special books are more than just ordinary stationery, however. These stamps given by the staff at temples and shrines used to serve as proof of someone receiving Buddhist sutra training. Everyone can participate in goshuin now, though, and some people even travel throughout Japan in order to collect more seals. Each temple and shrine has a unique seal design, which consists of stunning calligraphy and official stamps. Goshuin books are sold at temples and shrines, as well as in select stationery shops, and come in different varieties so you can choose your favorite. 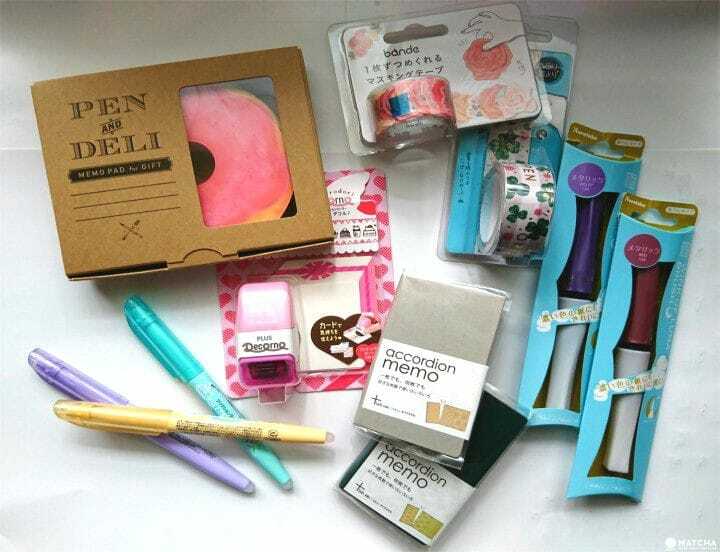 With these and so many other great stationery options to choose from, you're sure to have fun looking around in any of Japan's top variety goods stores and stationery shops. Who knows, you might just even find something that starts you on a new hobby while you browse through their selection too! Traveler's Factory Goods At Tokyo Station - The Perfect Gifts! The Best Souvenirs From Japan: Food, Sweets, Cosmetics, And More!